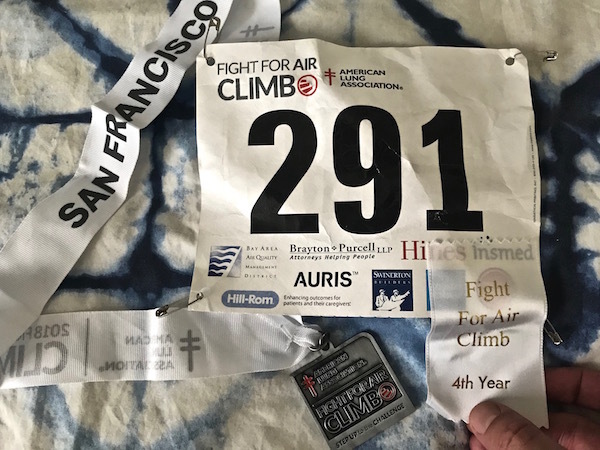 Every Second Counts (2018 San Francisco Fight For Air Climb Race Recap) | Keep It Up, David! 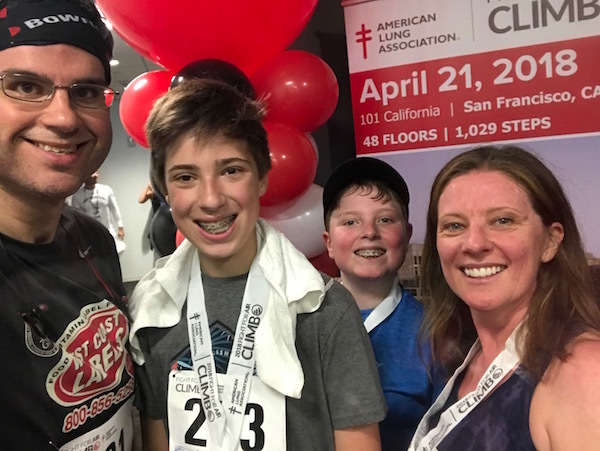 The race was the American Lung Association’s Fight For Air Climb in San Francisco, held in the 48-story 101 California building. 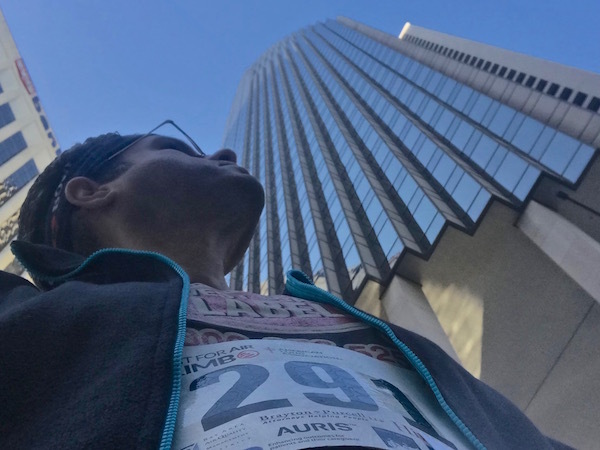 This was my fourth year competing in this race, and my second time racing up 101 California (the first two times were in a different building). And, for the third year in a row, I was joined by family members at the race. My 11-year-old nephew Eddie was climbing for the third year, it was my sister-in-law Alexis’ second year, and my 13-year-old nephew Maren got his first taste of tower running. I was in the competitive wave, and we were the first ones to enter the stairwell, around 9:15 or so. The start line was a pretty casual affair. Usually there are representatives from the timing company sending people off in a very organized manner, one every 10 or 20 seconds, but this time around, we were left to our own devices to enter when we wanted, a little while after the person in front of us. Alexis captured my start on video, which you can watch here. The climb itself went well. I like the stairwell, which is straightforward and consistent, with right turns, and handrails on both sides that are easy to grip and utilize, especially after the ninth floor, when the stairs narrow a little bit. I had forgotten my race watch at home, so I really didn’t know how I was doing during the race, except that I felt like I was pushing myself the right amount, and I was certainly breathing very hard and feeling my muscles get increasingly fatigued. Race organizers posted inspirational posters on the landings – sayings like “you didn’t wake up today to be mediocre” and “you didn’t come this far to only come this far,” and I appreciated those messages, because I caught my attitude starting to slip as the going really got tough during the second half. RELATED CONTENT: Check out recaps from my previous San Francisco stair races, in 2017, 2016, and 2015! There was a photographer in the stairwell one floor below the finish line, and I had already begun my end-of-race sprint at that point. (I’ll have access to those photos in a couple days.) Two flights after that, I crossed the finish line, let a volunteer cut the timing chip off my shoe, and fell into a corner on the floor. That corner turned out to be next to the men’s room door, and someone almost stepped on my head going through that door, so I pulled myself up into a sitting position until my heart rate came down. 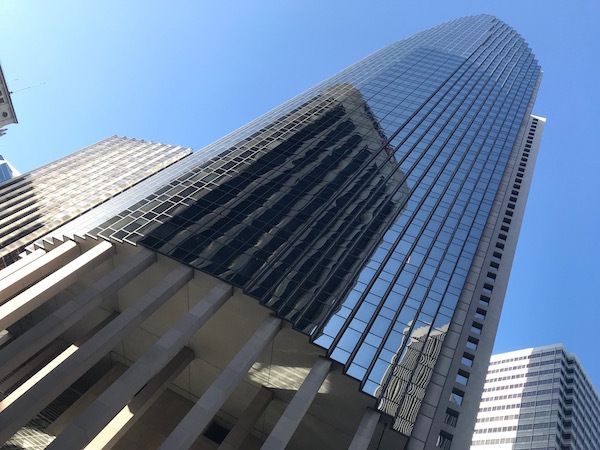 There was a post-race party last year on one of the highest floors, which was vacant office space, but in the past year it had been rented, which meant that this year there was no access to views. Seeing the city from the finish line is always a highlight of these races, so that was a bummer. 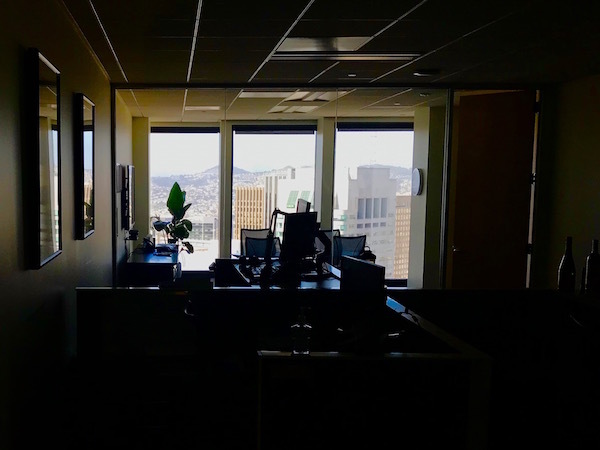 The closest I got was looking through an office suite to the windows on the far side. I didn’t hang out at the top for long. I headed back down, met up with Alexis, Maren, Eddie and Steve (my brother, who wasn’t racing, but came along to cheer us on), and we returned to the start line, so the others could do their climb. RELATED CONTENT: This was my 58th stair race. Looking for recaps from the 57 others? Click here! Maren entered first, followed by Alexis, and then Eddie, with me at the back of the pack. Maren and Alexis soon zoomed ahead, and Eddie and I climbed together, which was really fun. We must have entered in between waves (it was hard to tell, since the start line was so casual), but we had the stairwell entirely to ourselves for most of it. 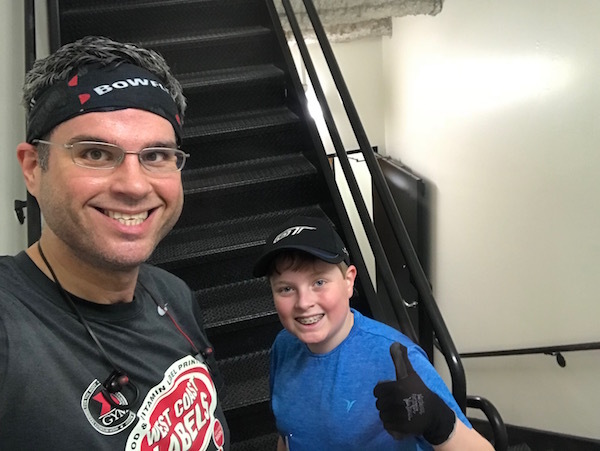 It wasn’t until the last 15 floors that a couple other racers caught up to us, and we caught up to a couple firefighters in full gear, which is always so inspiring to see. Stellar performances all around! And get this: That’s a 2-second personal record for me! A PR is always something to celebrate, whether its 2 seconds or 100 seconds. I finished 57th out of 576 finishers (top ten percent!). I finished 46th out of 298 men. I finished 13th out of 85 in my division (men 30-39). A great day in the stairwell! 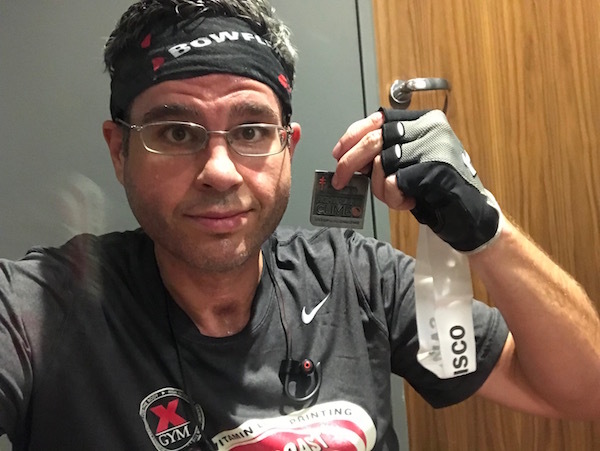 I proudly wore my Bowflex buff during today’s race, since Bowflex very kindly and generously sponsored me for this race. Check out my posts (like this one and that one) about their excellent products – I use them all the time and so should you! 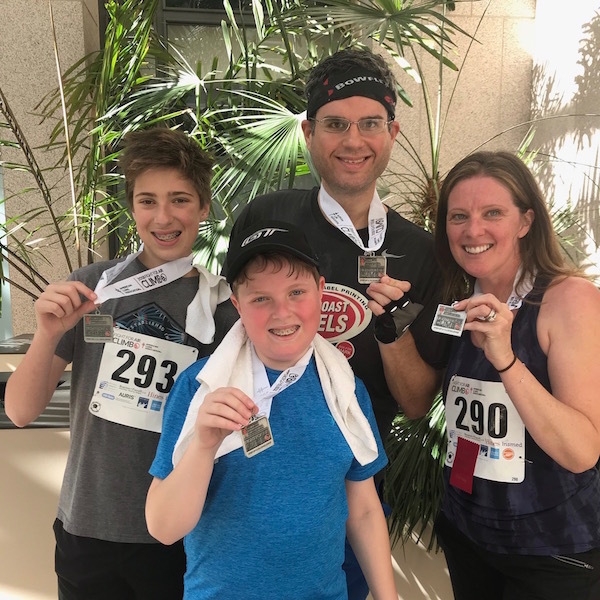 And sending lots of love and gratitude to Mike, Dana, Amy, Ann, and Joe & Joanne, all of whom very generously donated to the American Lung Association on my behalf so that I could race. You guys are the absolute very best! This entry was posted on Monday, April 23rd, 2018 at 12:01 am and is filed under Uncategorized. You can follow any responses to this entry through the RSS 2.0 feed. You can leave a response, or trackback from your own site. Way to go family!! Pretty soon, the youngsters might beat their Uncle David!! Had a great time with you and the boys. Next year I’ll try for a faster time! A brilliant effort by all.